Lemon, garlic, and red pepper flakes give this chicken an irresistible spicy zing, and the honey tones everything down to manageable levels (not to mention giving the breasts a beautiful golden color). To really ramp up the flavor of the sauce, there’s also a dash of coconut aminos (a Paleo-friendly substitute for soy sauce that you can find at health-food stores or online) and a few teaspoons of tapioca starch. The tapioca starch is just a thickener to make the sauce a little more like a glaze. If you can’t get any, you can leave it out; just be ready for a sauce that doesn’t stick to the chicken quite as well. If you’re strictly avoiding sweeteners, you can also leave off the honey, but just be aware that the flavor will change: you’ll get less spicy-sweet and more of a straight-up heat from the red peppers and the garlic. It’s still tasty, just in a different way. 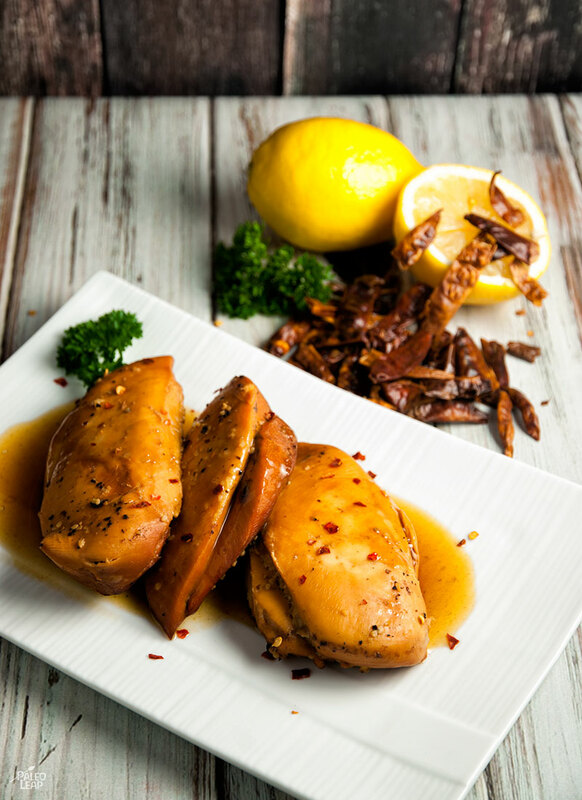 This chicken would be delicious with any Asian-inspired side dish, or just with a quick pan of sautéed broccoli or spinach. If you have any leftovers, it’s also great cold: chop it over in a salad with oranges, spinach, and kelp noodles and a spicy vinaigrette! SERVES: 4 PREP: 10 min. COOK: 6 h.
Place the chicken in your slow cooker. Combine the honey, vinegar, lemon juice, garlic, coconut aminos and chicken stock in a bowl and season to taste with salt and pepper. Pour the sauce over the chicken, cover, and cook on low for 6 to 8 hours. 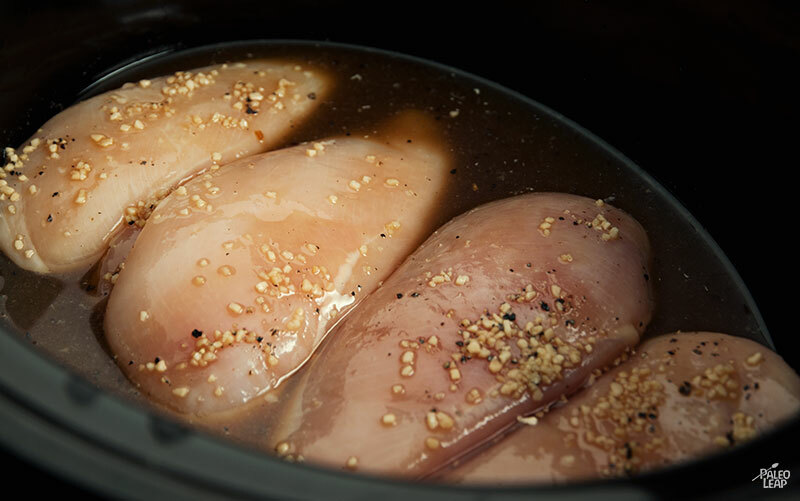 Take the chicken out of the slow cooker and pour the sauce into a saucepan. Warm-up the sauce over medium-high heat. Combine 2 tbsp. of water with the tapioca starch and add to the sauce. Let the sauce come to a boil and stir until it thickens. Sprinkle some red pepper flakes over the chicken and pour the sauce on top. Serve on a bed of your favorite steamed vegetables.